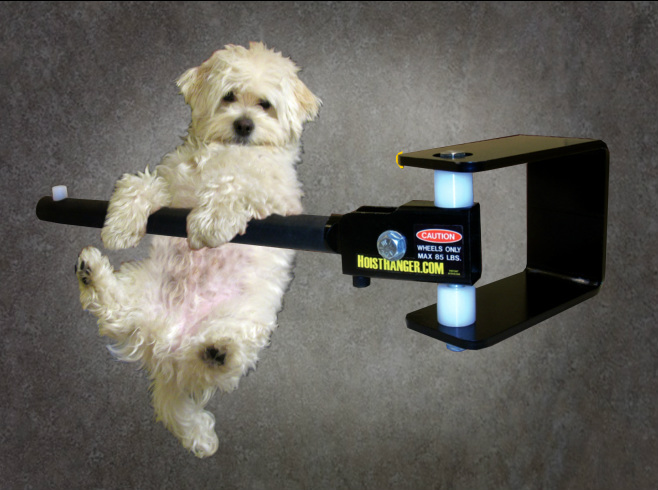 Hoist Hanger - Leonard's Auto Repair Inc.
Leonard's auto inc. is a distributor of the hoist hanger! This device is made to save your back when changing tires in an auto repair shop. There are many sizes available to fit your hoist. Eliminate workman's comp cases from injury from back strain or tripping accidents. The hoist hanger stores out of the way when not in use and holds up to 85 pound tires. Visit www.HoistHanger.com for more info and a video. Are you in the New England area? Len would be happy to visit your shop and show you in person how great and useful this product is! Our store mascot Bailey is just "hanging" out demonstrating for us. Contact us for Hoist hanger info!